A very important thing to consider in quoting a project is the end use and functionality of the final product. Many things can affect part unit pricing and need to be discussed before a valid price can be presented by the die caster that will reflect the long term expectations of the customer. In specifying die cast production, the purchase contract can be viewed as the purchase of a comprehensive engineering service from the die caster who will use the purchaser’s tool to convert metal to the precise form desired by the purchaser. The die caster will usually provide other important services, such as designing, constructing and maintaining the tool, and performing machining and surface finishing operations on die cast parts. Sub-assembly services may also be provided. The proposal and subsequent order for die castings sets forth a contract embodying the business practices governing a transaction in which custom engineered parts will be supplied on a continuing basis. Quality production of a high volume of custom parts, at the most economic level, involves a thorough understanding of the variables of the die casting process, its tooling requirements and related trimming, secondary machining and finishing operations. Aid in determining the detailed design requirements to be specified for cost-effective production can be obtained from the Engineering and Design standards and guidelines of the 2012 NADCA Product Standards, together with other recognized engineering data. Of equal importance to technical specifications are the commercial arrangements which affect the buying of die castings. These trade customs have evolved from a half-century of industry-wide production experience and have generally been accepted as good business practice. The commercial arrangements are found in the proposal and acknowledgement forms used by most die casters which reflect industry standards as set forth by NADCA in the commercial practices section of the 2012 NADCA Product Standards. These specialized inter-relationships, among others, govern the ability of the custom producer to supply die castings to specifications on prearranged quantity schedules at competitive levels on a continuing basis. They are described in the die casting product specification checklists in the NADCA 2012 Standards as C-8-1 Checklist (Die Cast Product Specifications) and C-8-2 Checklist (Die Cast Surface Finishing Specifications). 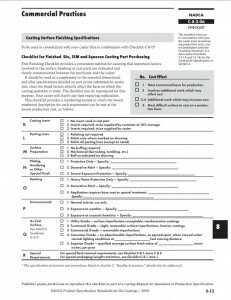 These two Checklists can help the purchaser more clearly define the die casting requirements that will impact final costs. They can serve as a production guide to help provide accurate communication between the purchaser and the die caster, avoiding misunderstandings later. 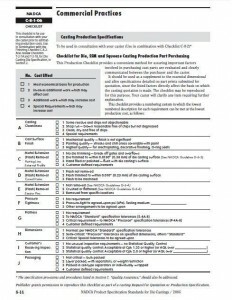 The die caster should review these specification levels with the purchaser to assure that the most cost-effective level is selected and, if necessary, provide samples of various specification levels. 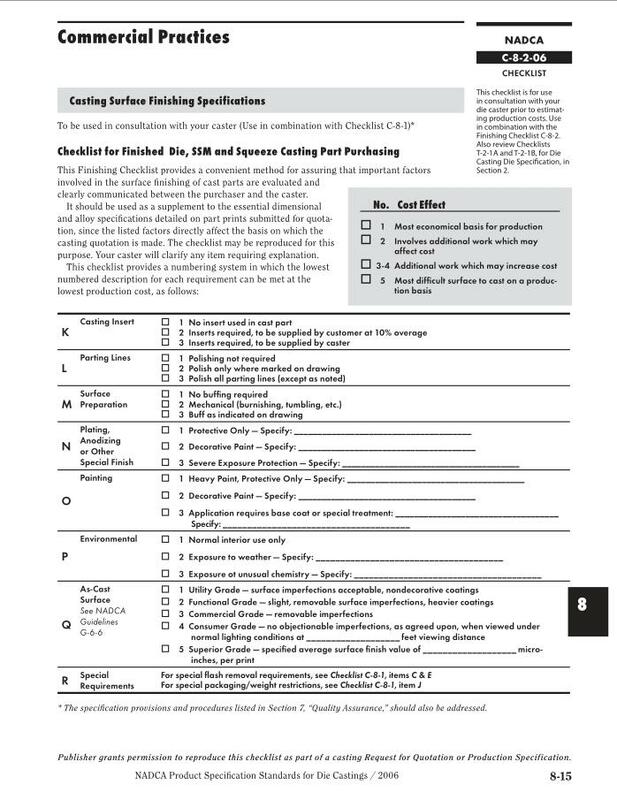 Both Checklists should be used as a supplement to the essential dimensional and alloy specifications detailed on part prints submitted for quotation, since the listed factors directly affect the basis on which the casting quotation is made, which may or may not be listed on the part print or 3D Model being quoted. 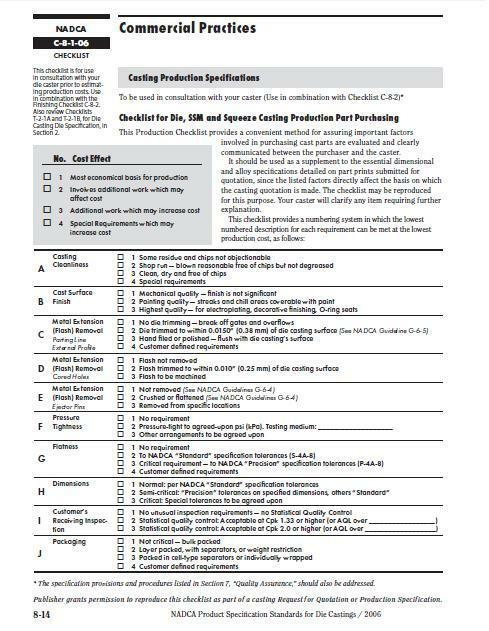 So if you are responsible for purchasing die castings you will find these Checklists a useful tool to use in the quoting process to eliminate omissions by the potential supplier, make sure you are going to receive the part in production you require, and avoid choosing a supplier that does not provide a sufficient level of detail in his quote. If you have any aluminum die casting requirement please send it to Premier Die Casting Company at lc@diecasting.com for a comprehensive review and quotation. What may appear low cost in the beginning with a simple quote may become expensive later if the requirements of the part are not explored in detail.